One reading of the social capital literature suggests that the networks and the social relationships which enable collective action can be used to address critical livelihood needs, even in disaster contexts. This paper concerns post-tsunami Aceh, where following the largest disaster in forty years, one of the biggest reconstruction programmes in history implemented livelihoods projects, making use of community led recovery approaches. This paper fi nds that social capital ideas stabilised policy thinking, legitimised project interventions, and provided a template for project action. Examining the eff ects of community led approaches in two sub-districts eight years after the tsunami, it compares the few instances in which particular livelihood projects led to enduring forms of collective action, with the majority of cases, in which these approaches failed to address the underlying drivers of vulnerability. Community led policy narratives often do not match with the logic of social action embedded in local networked space. 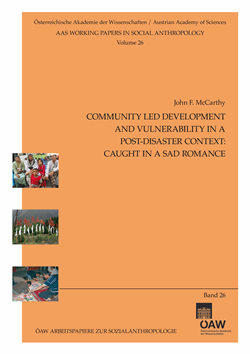 As interventions based on social capital ideas may have limited purchase in post-disaster contexts of this kind, eff orts to address vulnerability in post-disaster contexts need to address drivers of vulnerability in agrarian livelihoods in a systematic fashion, several moves beyond the narrowly focused community led livelihood interventions of post-disaster recovery.